Looking for water clarity without the maintenance of a fountain. Let us help you design an aeration system. 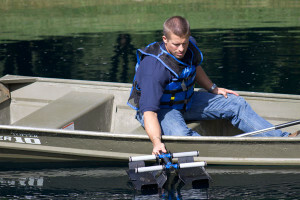 Get guaranteed results when we measure your pond’s size and map where the diffusers should be placed. Bottom diffused aeration systems are available for any pond size, depth or shape and can be placed up to 1,000 feet away from the pond’s edge. Our Techs will remove all makes and models of aeration systems and complete an onsite inspection including amp draw, power cord inspections and proper operation. Once removed and inspected, systems will be tagged and transported to our facility where they will be cleaned and evaluated for repairs if needed. We will provide a written estimate for any repairs necessary such as maintenance kits, damaged cords and air filters so repairs are complete and units are ready for reinstallation in the spring. All units will be stored at our facility for the winter. Our techs will transport the unit back to the pond and assemble, install and start unit, set timers and balance diffusers. Do I have to remove my fountain or aerator for the winter? All fountain units should be removed for the winter. If you use your pond for winter recreation than all aeration systems should be removed. Running the aerator in the winter is beneficial, however. The column of bubbles will keep a hole open in the ice, allowing for gas exchange during periods of heavy ice and snow. This circulation eases fish stress levels and also gives your bacteria a head start in the springtime. If you would like assistance with winter removal and unit maintenance, contact us regarding our Winter Storage Program. Aeration is the process of mixing a pond by forcing air through a diffuser plate at the bottom of a pond. The resulting column of air circulates the water from bottom to top, creating an opportunity for the entire water body to contact the surface/air interface. The majority of a pond’s gas exchange occurs at this interface where oxygenation is not the only important process. Toxic gasses from the sub-surface waters are allowed to escape into the atmosphere when the water body is mixed. The overall effect of aeration provides a healthier ecosystem for all forms of life involved. What’s the difference between a diffused air system and a fountain? A diffused air system is a shore-mounted unit that pumps compressed air to diffuser plates located on the bottom of the pond. This method circulates the entire water body, which eliminates stratification and aerates all of the water in the pond. Fountains (or fountain aeration) are located on the surface of the pond, with an intake that only draws from the top few feet of water. This does not eliminate stratification and only mixes a fraction of the water column. 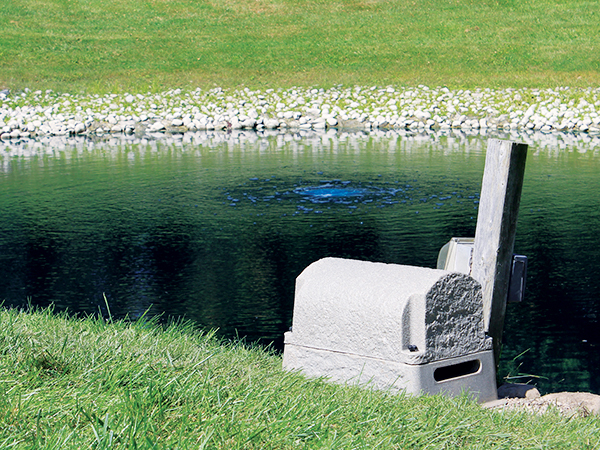 An aerated pond will be clearer, cleaner, healthier, and have less muck on the bottom. Aeration systems create an ideal environment for adequate gas exchange, allowing nature’s beneficial bacteria to eliminate excess nutrients and muck. As nutrient levels are reduced toxic gasses, excess algae/weed growth, and mucky bottoms are eliminated.